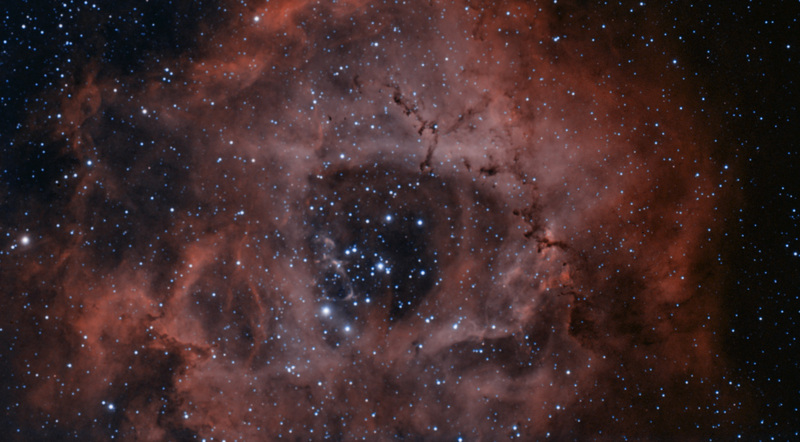 This image of the Rosette Nebula (NGC 2237) was taken by Chris Callaway on 26 February 2019 using a Takahashi 106ED and ZWO1600M camera with Baader LRGB filters. Integration time was 130 min. The image was processed in Astroart and Photoshop. Image © Chris Callaway. 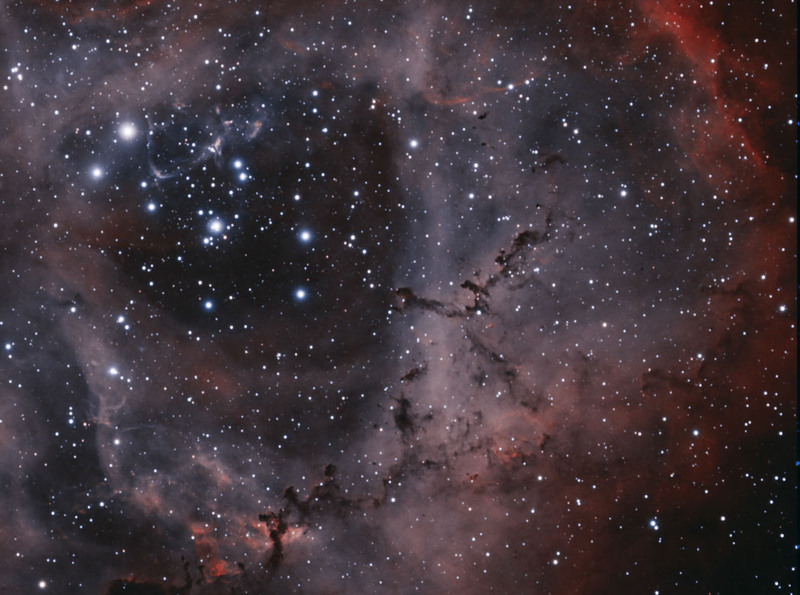 Mike Lancaster captured this image of the Rosette Nebula on the 4th March 2014. It is a single 15 minute exposure taken with a Mallincam Universe camera at 16 dB gain through a TS 80mm f/6 triplet APO, with TSFLAT2 field flattener and an Astronomik CLS-CCD filter on an NEQ6 Pro mount. No guiding, flats, darks or bias frames were used. Processing was done in Nebulosity 3, Elements 7, GradientXTerminator and Astronomy Tools. Image © Mike Lancaster. 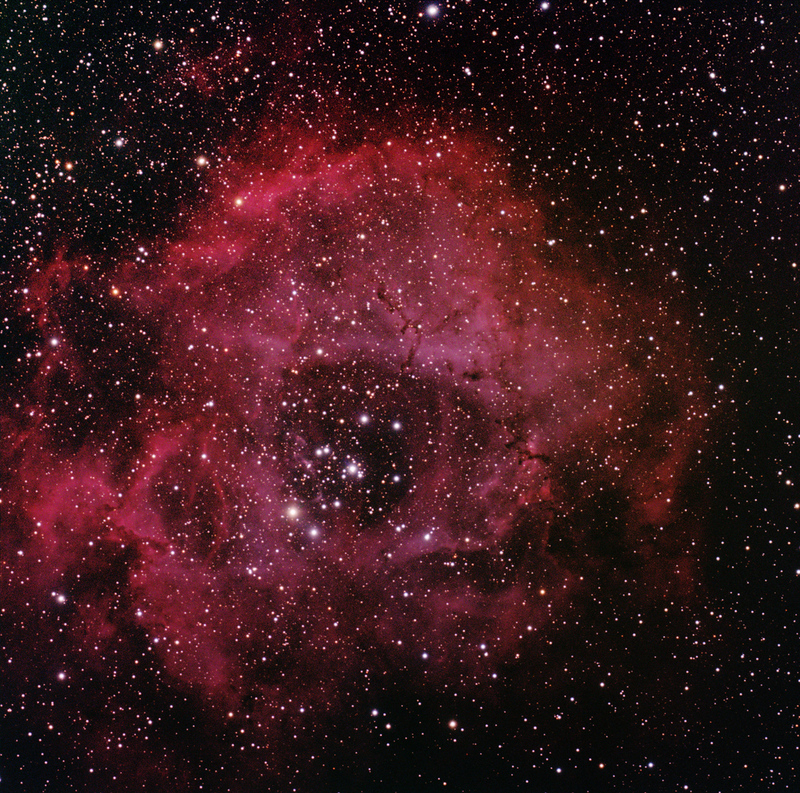 This image of the Rosette Nebula was captured by Peter Branson on the 21st February 2014. The picture is made up of 16 images of 150 seconds exposure each at ISO 1600. The images were stacked in Deep Sky Stacker and then the final image processed in GimpShop. No darks, biases or flats were taken to enhance the pictures and hence there is some vignetting in the final image. The separate images were taken with a Canon 1100D attached to TS Photoline ED102 refractor telescope with field-flattener and Hutech IDAS light pollution filter attached. The telescope was guided using an Orion Mini autoguider controlled by PHD software. Image © Peter Branson. 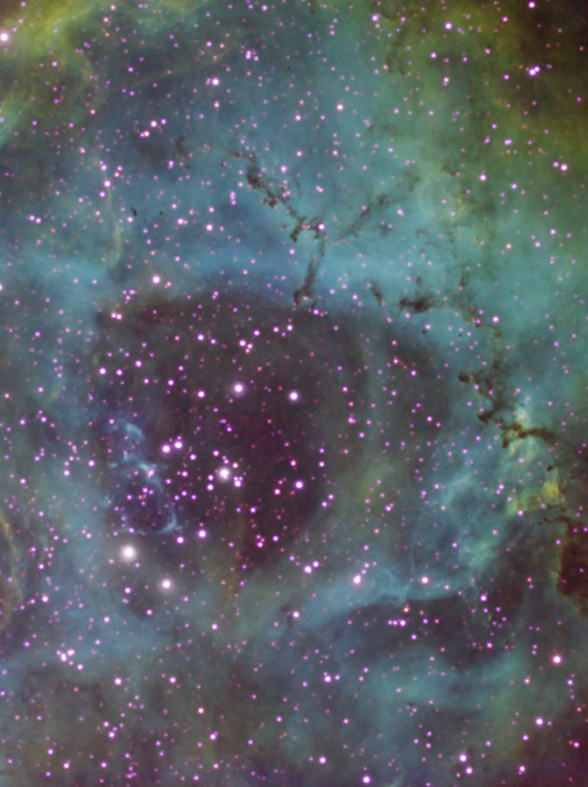 This image of the Rosette Nebula (Caldwell 49 - NGC 2237, 2238, 2239 and 2246) and the open cluster embedded within it (Caldwell 50 - NGC 2244) was captured by Adrian Brown over the nights of the 8th to 12th of February 2008 inclusive. Adrian used a Skywatcher 80ED Pro refractor, ATIK ATK16HR camera, Astronomik 13nm Hydrogen-Alpha and Oxygen III filters, and Celestron CGE mount. This false colour image was created by assigning the hydrogen-alpha data to Red, the oxygen III data to Blue and a synthetic green channel was created in Adobe Photoshop. The hydrogen-alpha channel alone is also shown below the false colour image. The imaging telescope was guided with GuideDog, a Skywatcher 80T guidescope, and ATIK ATK-2HS guide camera. Thirty-five 15 minute dithered exposures were made for the Hydrogen Alpha and twenty-five 15 minute dithered exposures for the Oxygen III. 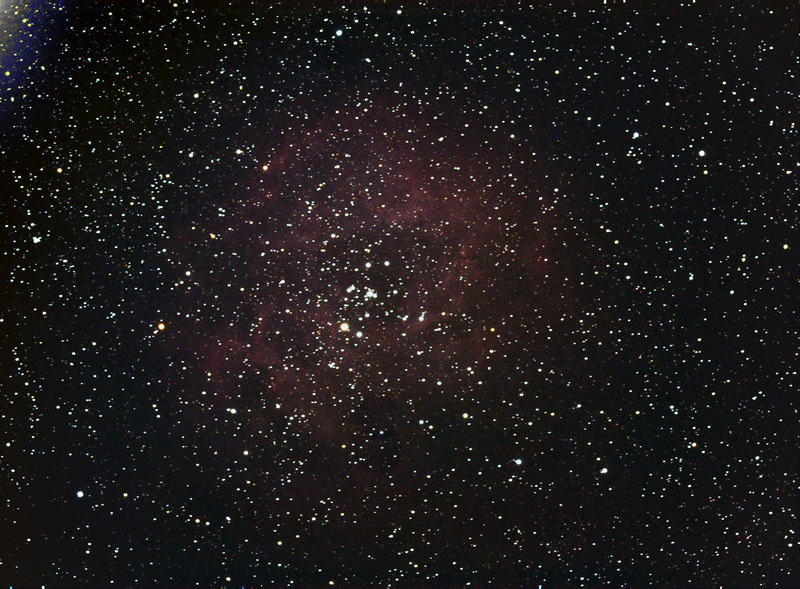 The raw exposures were calibrated in Maxim DL 4.53 using bias and flat fields. The exposures were then stacked in Maxim DL 4.53 using Russell Croman's Sigma Reject plug-in. The stacked Hydrogen-Alpha and Oxygen III master images were aligned with Registar 1.0. The Hydrogen-Alpha and Oxygen III master images were processed using levels, curves, sharpening and a noise reduction filter in Photoshop CS2. The synthetic green channel created in Photoshop CS2 using Noel Carboni's Photoshop Actions v1.5. The final colour balance and contrast tweaks were made in Photoshop CS2. Image © Adrian Brown. 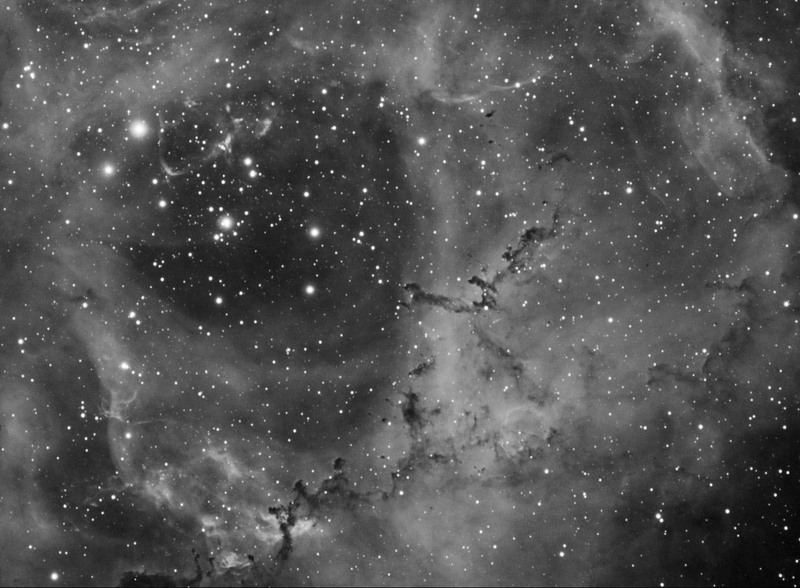 Adrian Brown produced this image of the Rosette Nebula (Caldwell 49 - NGC 2237, 2238, 2239 and 2246) and the open cluster embedded within it (Caldwell 50 - NGC 2244) over the nights of the 3rd, 4th, 5th, 6th and 7th February 2007. This is a bi-colour emission line image and is a mosaic created from 3 panels, evenly spaced across the nebula with an overlap of approximately 12 arc minutes (about 1/4 of the camera's field of view). The total exposure details are 32 x 10 minutes via a Hydrogen-Alpha filter and 45 x 10 minutes via an Oxygen III filter. Maxim DL 4 was used to calibrate for dark frame and flat field, combine the calibrated exposures and construct the mosaic images for each filter. Adobe Photoshop CS2 was used to create the final colour image by assigning the H-alpha image to the red channel, the [OIII] image to the blue channel and a synthetic green channel was created using Noel Carboni's Photoshop Astronomy actions. The imaging equipment was a Skywatcher 80ED Pro refractor at f7.5, an ATIK ATK16HR CCD camera (binned 2x2), Celestron CGE Equatorial mount, an Astronomik 6nm Hydrogen-Alpha and 13nm Oxygen III filter. Autoguiding was performed by GuideDog, a Skywatcher 80T refractor and an ATIK ATK-2HS CCD camera. A tri-colour version of the central part of the image by Adrian is also shown on this page below the bi-colour version. This image made Picture Of The Week on the BAA website during February 2007. Image © Adrian Brown. 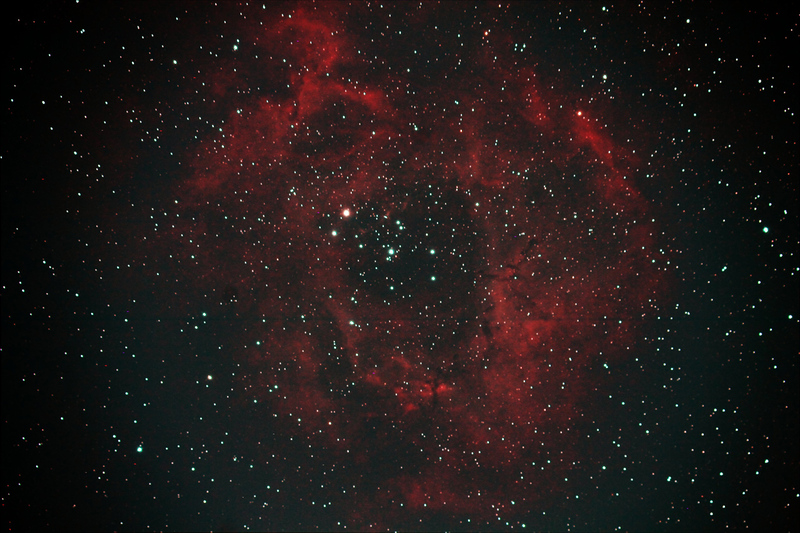 This is a tri-colour emission line image of the Rosette Nebula using the H-alpha and [OIII] data from the central panel of the previous image. Adrian added some additional data taken through a Sulphur II filter. Unfortunately, he was unable to get enough [SII] data for the full mosaic image as the weather turned cloudy! The exposure details are 16 x 10 minutes via an H-alpha filter, 26 x 10 minutes via a Oxygen III filter and 9 x 10 minutes via a Sulphur II filter. Maxim DL 4 was used to calibrate and combine the raw camera exposures. Adobe Photoshop CS2 was used to create the tri-colour image by assigning the [SII] image to the red channel, the H-alpha image to the green channel and the [OIII] image to the blue channel. The imaging equipment was a Skywatcher 80ED Pro refractor at f7.5, an ATIK ATK16HR CCD camera (binned 2x2), Celestron CGE Equatorial mount and Astronomik 6nm Hydrogen-Alpha, 13nm Oxygen III and 13nm Sulphur II filters. Autoguiding was performed by GuideDog, a Skywatcher 80T refractor and an ATIK ATK-2HS CCD camera.